Scene by Scene with Josh and Dean is a weekly podcast that dissects the award-winning film American Splendor — about legendary comic book writer Harvey Pekar. The podcast promises to reveal previously unexplored connections between the original American Splendor comics and the film’s construction, as well as behind-the-scenes insight into the comics-making process. Scene by Scene is geared toward fans and scholars of Pekar, indy comics, and movies. The podcast is hosted by cartoonists Josh Neufeld and Dean Haspiel, life-long friends and long-time American Splendor illustrators. Plus, Dean inspired producer Ted Hope to make an American Splendor movie and introduced him to Pekar! Each episode includes details about the original comics that inspired the scenes, Pekar’s life & career, the joys and challenges of being professional cartoonists, the nature of identity, truth in art, and the realm of memoir/autobiography. The tone is very much in the spirit of Josh & Dean’s friendship, characterized by irreverent humor and playful banter. Look for examples of Josh & Dean’s own illustrations, comics, and process drawings. Special guests will include other former Pekar collaborators as well as actors, filmmakers, and producers. Scene by Scene’s jaunty & jazzy theme music is by composer Evan Wilson. 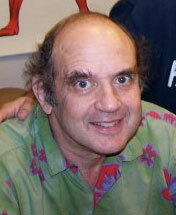 Harvey Pekar (1939–2010), a Cleveland-based writer, popularized autobiographical comics with his ground-breaking indy comic book series American Splendor, which debuted in 1976. Pekar’s unflinching honesty and fascination with the minutiae of everyday life made him a working-class hero to millions of readers. Pekar worked with such acclaimed illustrators as R. Crumb, Joe Sacco, Drew Friedman, Spain Rodriguez, Ed Piskor, Frank Stack, and Jim Woodring (as well as Dean & Josh). He gained additional fame in the 1980s with a series of memorable appearances on Late Night with David Letterman. Pekar and wife Joyce Brabner co-wrote the award-winning graphic memoir Our Cancer Year, about Pekar overcoming lymphoma. The American Splendor film, about Harvey Pekar and his wife/collaborator Joyce Brabner, was directed by Shari Springer Berman and Robert Pulcini, and stars Paul Giamatti and Hope Davis. Released in 2003, it won the Grand Jury Prize at Sundance, a critics award at Cannes, the Writers Guild Best Adapted Screenplay award, and was nominated for an Academy Award for Best Adapted Screenplay.